Watch It Live: lakelandgov.net/TV or on Spectrum 643/FiOS 43. Chairs: Spectators are asked to refrain from placing chairs until the evening before the parade. In addition, the city is asking spectators to keep sidewalks clear for wheelchairs, walkers and scooters. On Thursday, the city posted a notice on Facebook that chairs blocking sidewalks, crosswalks or disabled parking will be removed or relocated. Accessibility: Wheelchair-accessible viewing areas are on both sides of Main Street near the Lakeland Fire Department HQ. 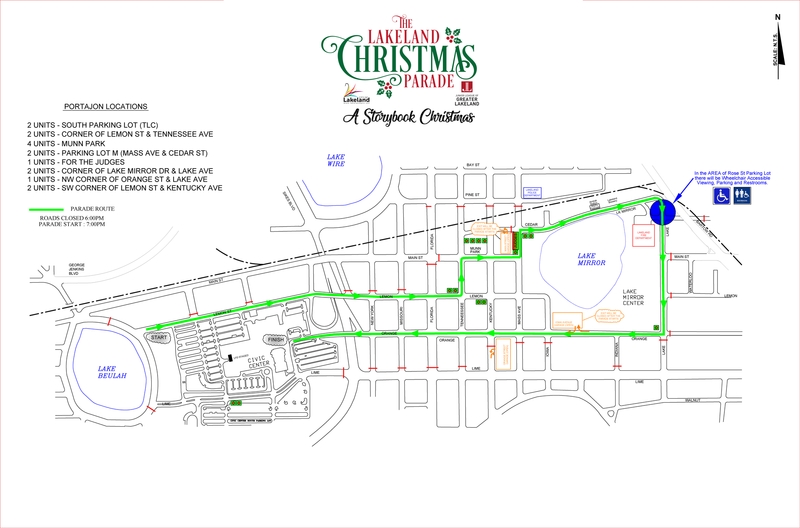 Streets/parking: Streets along the parade route will begin closing at 4 p.m. Public parking is available on open, non-parade-route streets, in public lots and parking garages (map). Accessible parking will be available in the Rose Street parking lot for vehicles with a disabled parking permit. Toilets: Portajons are marked in green on the map. Security: LPD typically has 150 officers on duty at the parade.